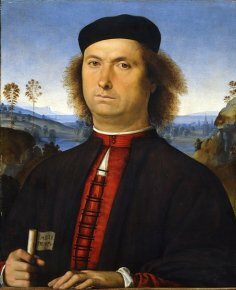 This is the first time that such an extensive exhibition on the Italian Renaissance has ever been organized in Hungary. This type of retrospective often is cause for skepticism, as it tends to cover too wide a field on already well-known questions and presents fragile works, a point which should thus be taken into account in making a fair evaluation. The exhibition at the Budapest Fine Arts Museum is a fine success, combining two major achievements : a very pertinent choice of works which does not limit itself to a number of famous masterpieces but offers a few jewels held in lesser known establishments, even private collections along with a very productive comparison with some of the most beautiful paintings in its own collection. The arrangement is understated, traditional and rather effective despite the sometimes impractical, because too narrow, spaces. The chronological range, as we said, is large, spanning the 15th and 16th centuries from beginning to end. 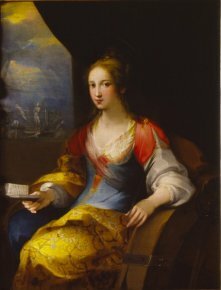 The last painting, a remarkable Saint Catherine of Alexandria by the Siennese Ventura Salimbeni (ill. 1) even dates from 1606. However, not everything is of equal artistic quality. The beginning of the visit is weaker than the rest, no doubt due to problems in borrowing and transporting paintings which are too valuable. It would have perhaps been more realistic to omit the first half of the 15th century. One of the first revolutions resulting from the Renaissance, the appearance of perspective, is in fact not really illustrated due to a lack of corresponding works, despite the presence of a canvas by Paolo Ucello, Scenes from the Lives of the Hermit Saints (Florence, Galleria dell’Accademia). Nonetheless, visitors can admire the charm of a dyptique of the Annunciation by an artist who is rarely seen outside of Umbria, Bartolomeo Caporali. One of the first masterpieces is also a dyptique of the Annunciation, by Giovanni Bellini  (ill. 2). The National Gallery in London sent its very beautiful David and Jonathan by Cima da Conegliano and the Uffizi the Portrait of Francesco delle Opere (ill. 3). Indeed, most of the big museums lent one or two paintings with the Louvre once again lending a Raphael (the Double Portrait) and a Titian, Man with a Glove… The Szépmûvészeti Museum has organized its communications campaign around the Woman with Ermine by Leonardo da Vinci, on loan exceptionally from the Czartoryski Museum in Cracow. Raphael is not represented only by the Louvre painting or the famous Estherazy Madonna from Budapest (ill. 4), but also by a Saint Sebastian from the Carrara Academy and Christ Giving His Blessing from the Pinacoteca Tosio-Martinengo in Brescia (the two biggest lenders to the exhibition). Visitors however might prefer discovering such little known works as the Virgin and Child by Giovanni Antonio Boltraffio (ill. 5) or the extraordinary Ecce Homo by Sodoma (ill. 6) held in a private collection in Modena, and presented here in juxtaposition to the Death of Lucretius by the same artist but owned by Budapest. The 16th century is magnificently represented here. There are notably a series of Venetian paintings, with at least eleven major Titians. Some works come from other Hungarian museums such as the one in Eger (Dosso Dossi, Jacopo Bassano…). In fact, there is a very untypical Bassano canvas, the Martyrdom of Saint Catherine of Alexandria (ill. 7) in which the artist came up with an original solution for representing this scene. 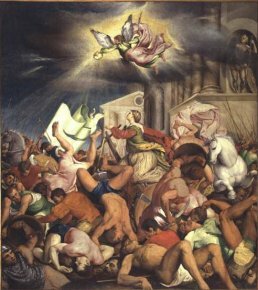 The saint is seen praying peacefully above the rowdy crowd reacting to the divine intervention which saved her from her torture on the wheel. 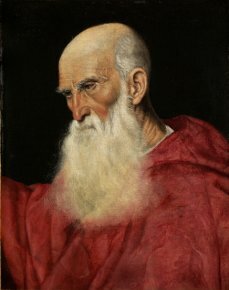 Another painting from the Fine Arts Museum in Budapest, from the Lucien Bonaparte collection, the Portrait of a Cardinal (ill. 8), with sharply defined features, is attributed to Bassano only because of its realist style, quite different from the artist’s usual manner. Several works by Tintoretto and Veronese round out this Venetian section, undoubtedly one of the richest in the exhibition. The exhibition closes with several Mannerist paintings from different schools. Next to a work by Lelio Orsi, another Martyrdom of Saint Catherine, with a strange iconography as always in this painter, and here the curators should again be commended for the pertinence in their choice of canvases : two portraits, one by Sofonisba Anguissola (Bernardino Campi Painting Sofonisba Anguissola, Siena, Pinacoteca Nazionale) and Bartolomeo Passerotti (Portrait of a Man with a Dog, Rome, Pinacoteca Capitolina) are masterpieces by two artists of different stature. 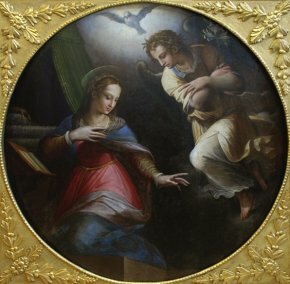 The same may be said of a large tondo by Giorgio Vasari (ill. 9) from the Sgezed Museum (Hungary). 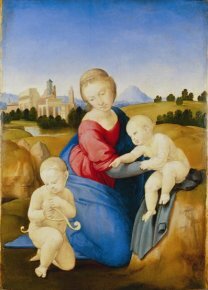 This choice nonetheless allows the exhibition to present, with a little over 130 paintings, a complete and in fact quite faithful panorama of the Renaissance in Italy. The exhibition is accompanied by a large and beautiful catalogue which has also been published in an English edition. Under the supervision of Dora Sallay, Vilmos Tatrai and Axel Vecsey, Botticelli to Titian. Two centuries of Italian Masterpieces, Szépmûvészeti Muzeum, 2009, 444 p. ISBN : 9789637063688. Visitor information : Szépmûvészeti Múzeum, Dózsa György út 41, 1146 Budapest. Phone : +36 1 469 7100. Open daily from 10 to 18 (tuesday until 22, friday and saturday until 19). Rates : HUF 1 400 (reducted : HUF 800). However, this attribution has been contested.